As previously noted one of the motivating factors for our city exodus was to live off the land and make furniture. Well, this weekend we got one step closer. Over the past few weeks in between the renovation projects M has been bolt by bolt assembling the LumberMate Pro (yes, that is the actual model name), which will soon slice through those logs we’ve had sitting around, and many more, like a cheese slicer. For such an impressive, and might I add dangerous, machine we were impressed that it came flat packed like an Ikea dresser. Not a single piece came pre-attached and the assembly manual was like a college textbook. 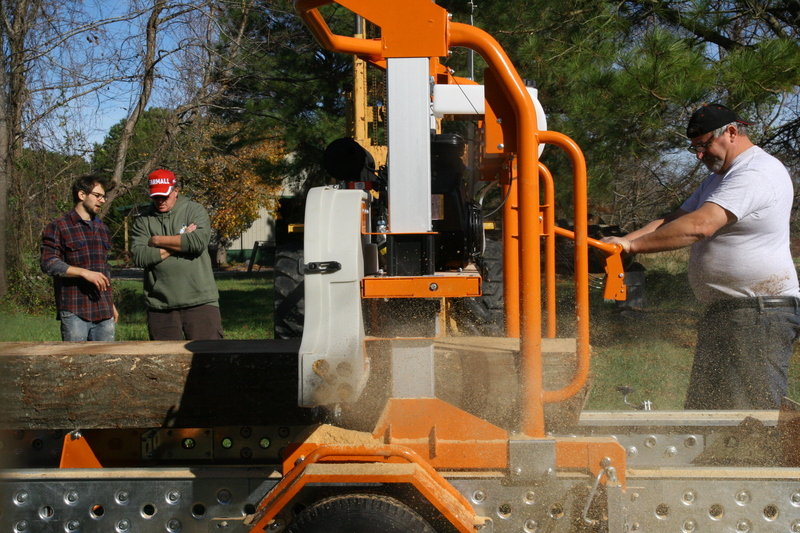 Nonetheless, after hours upon hours of meticulous assembly (by many hands, but mostly M’s) over Thanksgiving weekend M and Dad G finally mounted the band blade and rolled the sawmill out to the field to test it out. For the record, this thing is intimidating. And awesome to watch. Here’s the procedure, as demonstrated by Mark and Paul Bunyan. 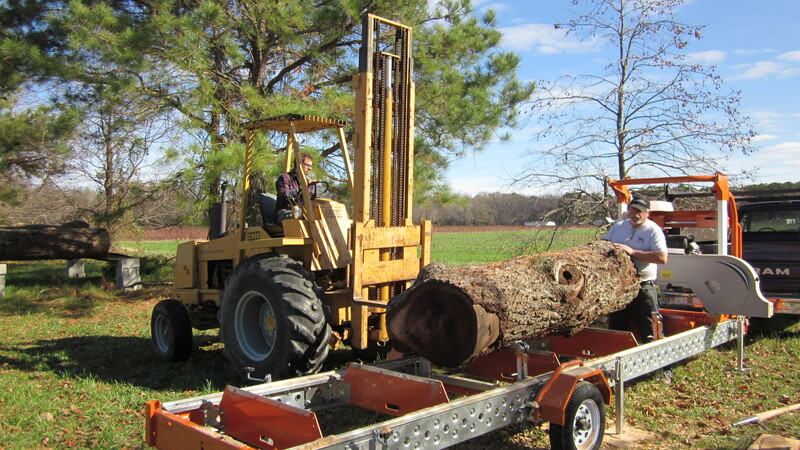 Step 1: gingerly pick up a 1,700 lb log with the fork lift and place it on the sawmill. Step 2: position it just so … we want the beauty of that woodgrain to sparkle. Step 3: everybody stand back. Seriously, stand back. 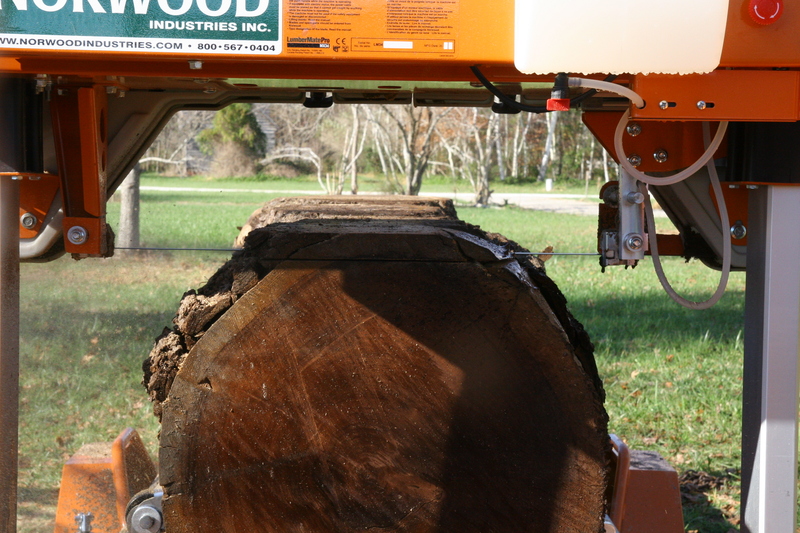 Step 4: lightly guide the machine as it tears through the log. Step 5: remove slab. Smile widely. Step 6: stand back and admire these gorgeous flitches*. 1. A salted and cured side of bacon. 2. 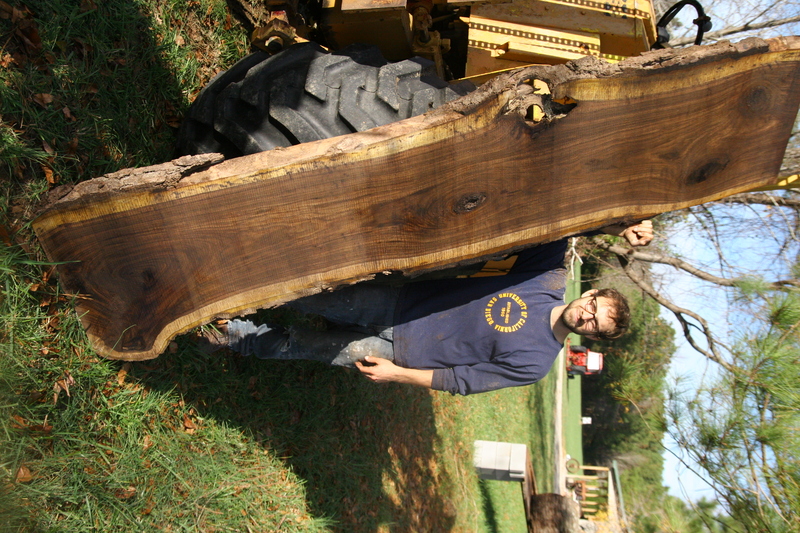 A longitudinal cut from the trunk of a tree. Ok, so the order of those photos isn’t exactly chronological. 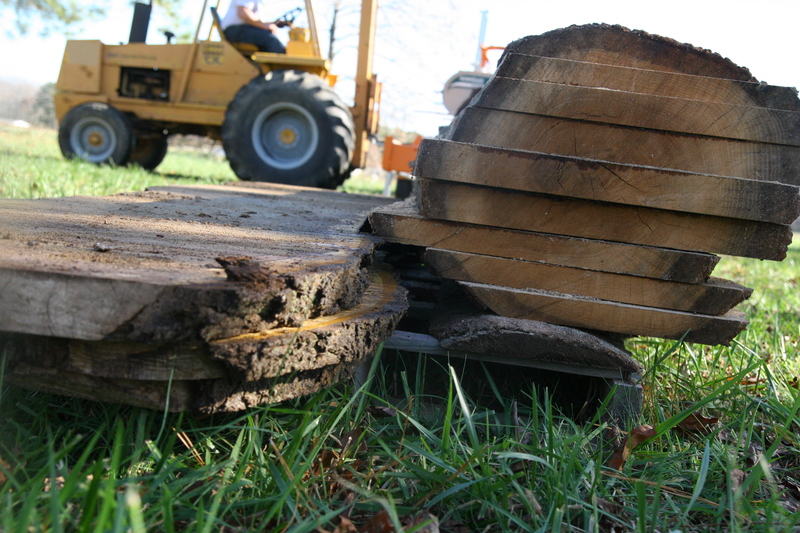 This shows oak and walnut logs; we blazed through one and a half logs before hitting upon a decades-old clothesline pulley that the walnut tree had grown around and no one knew was in there…needless to say, M had to order new band blades. 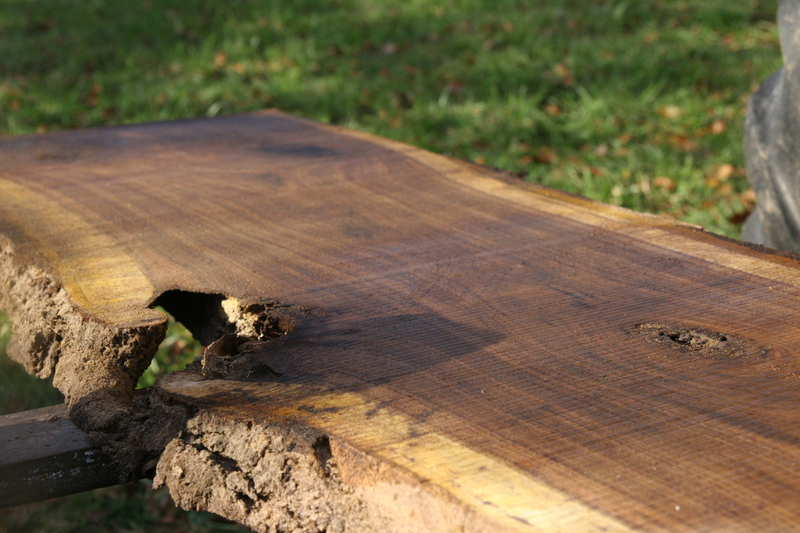 Tags: lumber, oak, sawmill, walnut. Bookmark the permalink. Previous post ← Garden Update: Thanksgiving! I can NOT believe you/M assembled that yourselves! Wow!! And the flitches – gorgeous! Can’t wait to see what can be make of it!! !